Dinner 5 to 7pm. Auction begins at 6pm. Info/Tix call (209)586-7332. 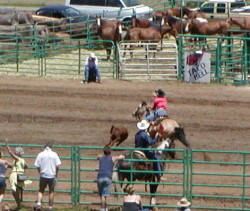 2006 Oakdale Rodeo 2006. California Rodeo Season Opener. Since 1954, and the 1st outdoor rodeo in the US. Located between Manteca and Twain Harte. End of April to approx. 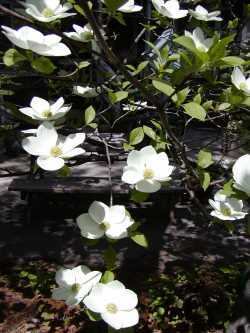 mid May 2006 Dogwood Trees 2006 bloom throughout the Twain Harte Village and surrounding mountain area. What a sight! 2006 Children's Easter Sunday Egg Hunt '06, sponsored by Twain Harte Rotary. Eproson Field, Twain Harte, Sunday at 1pm. Rodeo Parade downtown Sonora, May 13 at 10am. Rodeo 2pm and Dance 8pm. Rodeo Sunday also. At Tuolumne County Fairgrounds, in Sonora. 2006 Calaveras County Fair, Rodeo & Frog Jumping Jubilee. Carnival rides, Rodeo, frog jumping, food, beer, and live entertainment. Spectacular setting! Great for the whole family! 2006 10th Annual Soroptimist International Twain Harte a la Carte 2006. Taste wines & beers, fine foods, live music and silent auction by Twain Harte Soroptimists International at 5-7pm on Saturday May 20, at 2006 Meadow Plaza, 2300 Meadow Lane, Twain Harte. Proceeds benefit community projects. $30 per person (209)533-0889. WOODYFEST 2006, 10am-3pm. Woody Car & Boat Show sponsored by Woody's Cabin Outfitters, downtown Twain Harte. BBQ & Prize Raffle. All proceeds go to Twain Harte Fire and Rescue. For info call (209)586-4274. 3rd Annual Twain Harte Veterans Dedication of a new veteran's WWII flag with color guard and pomp-and-circumstance parade followed by a flag-raising at 11:30 a.m. under the Twain Harte arch. An All-American Hotdog Picnic follows at Eproson Park, $1. CANCELLED FOR 2006! Camp Okizu 3rd Annual Festival of Fun at the Rock. Includes car show. For more info call Diane Dunnigan 209-586-2080. Next event Summer 2007. Cowboy Cookout! Saturday June 10, 2006; 5:30pm Social half-hour, 6pm dinner at Twain Harte Community Center, $35/person. A benefit for Partners For Twain Harte. Call Nancy Maxwell for reservations 209-586-0773. Limited seating. Movies-Under-the-Stars 2006 in Eproson Park at the Rotary Stage and lawn. At dusk every Friday night June to September. Free admission, but a small donation is welcome. Bring a chair or blanket. Concerts-in-the-Pines 2006 Saturday evenings. Music in Eproson Park, Twain Harte, 6pm-8pm*. Presented by the Twain Harte Chamber of Commerce. Admission is free, but a bucket is passed for donations. August 19-Rick and the Rockets ('50's Favorites) Special time 7:00-9:00pm. Held with Rotary BBQ at the ball field. September 2-Silvermoon Allstars (Classic Rock 'n Roll). End of Summer '06 show. Fridays June 30 thru Sept 1/06 , 4pm to 6pm in Eproson Park. All produce certified as grown by the participating farmer. Produce, breads, flowers, etc. Sonora Pass Wagon Train Trek. An authentic re-enactment of the crossing of the Sonora Pass by early settlers--which terminates in Twain Harte. Event is not yet scheduled. A Grand "Street Festival" in downtown Twain Harte. 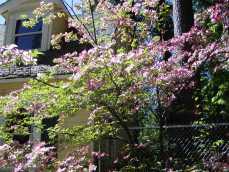 Includes crafts, food, entertainment, wine tasting; Wine Tasting Saturday & Sunday. Charity fundraiser. Eproson Field, BBQ 5-7pm. Live band 7-9pm. 2006 Twain Harte Fire & Rescue Pancake Breakfast fundraiser, Sep 2/06 8am-noon. The Annual Twain Harte Triathlon 2006 is CANCELLED! Contact info@onyourmarkevents.com or call (209)795-7832 for more info. Oktoberfest 2006. Crafts, art, music, a custom car show (Saturday) and a beer tasting (Saturday 1-4pm, Tasting fee:$12 to benefit scholarship fund). Daily 10 am to 5pm at Eproson Park in Twain Harte. For more info call (209) 586-4482. 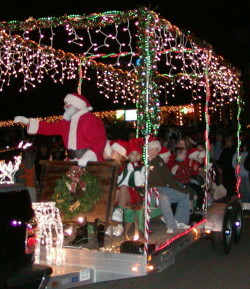 Twain Harte Annual Lighted Christmas Parade, carolers, and the lighting of the 150-foot living Christmas Tree in downtown Twain Harte village, 6pm. Carolers beginning at 5:30 p.m. Twain Harte Village Shopping: Stores open 'til 8pm for your shopping pleasure. Carolers will sing for your entertainment.